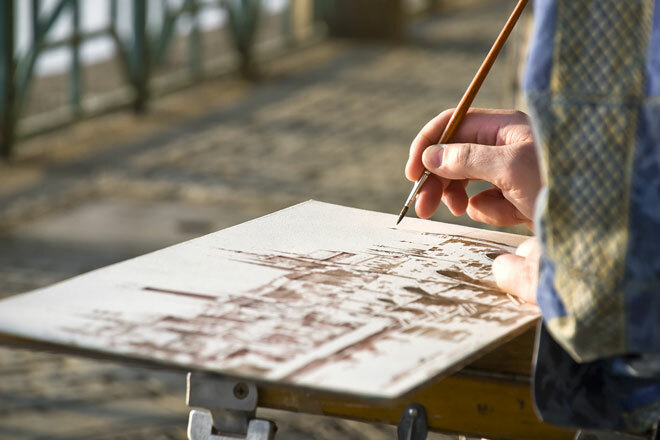 Watercolor painting offers an opportunity for an artist to travel with a purpose. There are scheduled painting tours and workshops in unexplored places, or the artist may simply travel to an area of interest and paint the scenery. When traveling, the watercolor artist must consider how to transport equipment and supplies. Of course, if driving, the car can be loaded with anything desired, and smaller packs can be used for stops along the way. But for travel involving public transportation, the artist needs to consider what to bring and how to pack a small amount of supplies. And with airline restrictions, consider what to carry on, check thru, leave home, or purchase at the the final destination. Small travel watercolor or field kits are sold just for this purpose. Some have empty palette boxes so the artist can fill them with their choice of paint colors and brands that they frequently use. There are collapsible water containers, brush holders, pencil cases, and lightweight easels that have telescoping legs. Paper can be cut into travel-friendly sizes. And, or course, water bottles are usually available anywhere. Sketchbooks and journals are favorite traveling companions to record sights along the way. And, don't forget a camera for reference photos so that small paintings can be enlarged back in the studio. Robert Matthew Wolferstan's representational watercolours are predominantly local scenes familiar to any who know and love Victoria, and British Columbia's coastal waters. Born and raised in Victoria, Wolferstan gives an 'insider's' look at the area through his paintings. His watercolours are very precise in detail, yet hold an intimate feel for the subject and the mood of the piece.brbrMostly self-taught, Wolferstan's formal training includes completion of the Foundation year at Emily Carr Institute of Art and Design in Vancouver, BC, instruction in portrait painting in oils with local portraitist David Goatley, and work in Italy under British watercolourist Alan Reed. Wolferstan is currently pursuing an Illustration/Design diploma at Capilano University in North Vancouver.